I had already bought everything for a different costume – then two weeks before the Halloween party, inspiration struck! I rummaged through my attic to find some old baby clothes and my baby carrier and I was on my way. The most difficult part was finding shoes and a dress for a 6’1″ 200 lb. man! 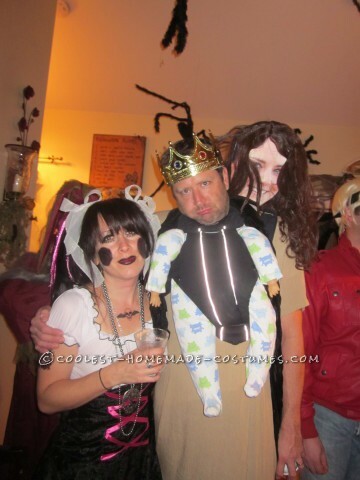 In the end, everything came together as planned and my costume won rave reviews – and easily earned top prize at the party. It was hard remembering that I had a second head, so doorways were challenging at first. Everyone wanted their picture taken with Baby George, including my wife, a Gothic rag doll, who is also in the picture. It was funny seeing people’s reactions, especially considering that I forgot I looked like a baby all night! I hope you like the costume!